The American Tea Party hates Obamacare. They hate it with a visceral passion because it's a government program that may - just may - succeed where the private sector failed. Such a success would invalidate basic Tea Party tenets, so they fight it with everything they have: a few rational points and a barrage of lies, half-truths, and innuendo. Sadly, the tactic worked. Instead of a rational debate on national healthcare, we have a cacophony of non-points and negations. Some of the same people also hate climate science, and for the same reason: if the science is right, then their premises are wrong, and that can't be. So they bring out the lies, the half-truths, and the innuendo - again polluting public discourse. But the ideological right doesn't have a monopoly on this brand of intellectual pollution. Some of our friends in the environmental community have applied this same tactic to their own bogeyman: a new wave of tools to finance forest protection called "REDD+". The acronym stands for "reduced emissions from deforestation and degradation", and it describes a set of practices that includes the use of private carbon offset purchases and government-to-government payments earned by people - and policies - that save the world's critical forest areas. REDD+ has emerged as our most powerful tool for financing forest conservation, and forestry-based carbon offset purchases alone have financed the protection of over 26 million hectares in developing countries, according to data that we'll be releasing in our next State of Forest Carbon Markets report. That's larger than the entire forested area of the Democratic Republic of the Congo, or the total land area of Ecuador. Along the way, programs using REDD finance have put tens of thousands of indigenous people to work and preserved the habitat of 139 endangered species. Results like these have earned it the backing of indigenous people from Brazil to Kenya, the support of green-minded companies like Disney and Microsoft, and the sponsorship of lawmakers from Mexico to Indonesia. Well-regarded international NGOs from Conservation International to The Nature Conservancy not only employ these tools to fund their massive conservation solutions, but spearheaded their creation more than 30 years ago. Yet certain ideologues hate REDD, and they hate it with the same visceral passion that the Tea Party hates Obamacare. They hate it because they think the profit motive got us into this climate mess, and there's no room in their worldview for a market-based mechanism that succeeds where philanthropy and traditional policies have failed. Rather than subject their views to the pros and cons of rational debate, however, they've unleashed their own barrage of lies, half-truths, and innuendo; and like the Tea Party barrage, it's worked. Even the generally reliable Atlantic Monthly took the bait, and the result is a piece entitled "The Forest Mafia: How Scammers Steal Millions Through Carbon Markets". It harvests a particularly cartoonish anti-REDD meme from an entertaining but sloppy segment that the Australian version of 60 Minutes produced last year. The piece tells the story of David Nilsson, a serial swindler who likes to talk big and dress like Crocodile Dundee. A few years ago, he pretended to be a forest carbon project developer, and he tried to swindle some indigenous people in Peru. His goofy plans, however, didn't resemble any legitimate attempt at forest carbon mitigation, and most of the indigenous people he targeted as partners wouldn't sign with him. The contracts he did sign were declared invalid, and he was roundly ignored by everyone who knew anything about conservation-based climate solutions. He has also been rightly barred from ever entering Peru, according to media reports. 60 Minutes rightly identified him as a charlatan, but they failed to differentiate him from the legitimate (i.e, boring) conservation project developers who really are using these financing tools to save endangered rainforest. Then (perhaps because there's no glory in "exposing" an irrelevant wannabe), 60 Minutes cast him as the Bond Villain of the carbon markets: the archetypal "carbon cowboy" who is too colorful to resist, too easy to lampoon, and too much of a clown to be taken seriously. Al Jezeera picked up the meme as well, and now the Atlantic has taken the bait. The Atlantic rightly pillories Nilsson's revolting attempts to swindle indigenous people, but it also implies that these practices take place in legitimate REDD projects. In so doing, it ignores the fact that conservation projects only work if indigenous people are on board. That, in fact, is a pillar of REDD finance and part of its beauty: it rewards indigenous people for acting as guardians of the rainforest, because it compensates them for being providers of an ecosystem service. While logging and mining extract value from the forest, conservation finance helps indigenous people keep the value there, and that means it requires their active participation. That means it works best if you treat them as equal partners rather than as museum pieces. Legitimate project developers have always worked with indigenous people as equal partners, and the new generation of project developers are indigenous leaders themselves - like Chief Almir Surui (Disclosure: I'm helping him on his autobiography). He spent the last six years building a privately-financed conservation project by and for his own community. REDD made his project possible, and REDD itself was made possible by existing carbon standards. Standard-setting, by the way, is another pillar of REDD finance, but the Atlantic makes only passing reference to it - and when it does, it gets it wrong, referring to the Verified Carbon Standard as the "Voluntary Carbon Standard" - a moniker that VCS abandoned two years ago. By ignoring its sophistication, the story is able to characterize REDD as a well-intentioned device that was created by eggheads but then hijacked by scoundrels like Nilsson. In reality, the Nilssons of the world are frozen out of REDD, largely because the eggheads who created VCS and other standards knew what they were doing. But the eggheads don't blunder around the forest dressed like Crocodile Dundee, so they don't make good television, and they don't get covered by 60 Minutes. Anyone who has worked in media knows what's happening here: a fun read needs a compelling villain, and Nilsson comes prepackaged. He's the perfect foil for a grandstanding journalist trying to cast himself or a favorite "activist" in the role of hero. If a journalist wants to cast the people he's writing about as heroes and villains, he should at least make sure the characters are relevant to the larger issues he's trying to explore. Why pick out a clown like Nilsson when scores of interesting and relevant climate heroes are doing private conservation right? Almir is a "certified" hero, and he also dresses colorfully (Cowboys and Indios, anyone? ), but there are scores of others. American project developer Mike Korchinsky and his Kenyan partner, Chief Pascal Kizaka, are using REDD to protect 500,000 acres of endangered forest in the Kasigau District in Kenya, while a woman named Leslie Durschinger is working with Buddhist Monks and subsistence farmers in the former Khmer Rouge stronghold of Oddar Meanchey, Cambodia, to save forest there. Both of these are fascinating (and colorful) stories that illustrate how REDD really works. Both projects broke new ground - both technically and socially - in project development, and both have been virtually ignored by the mainstream media. The National Geographic of Canada did actually dive into the weeds of a project there in a way that was entertaining and informative, but that's the exception that proves the rule. Other coverage of the same project has been muddled at best. Critiques of REDD are certainly needed if the mechanism is going to deliver real benefits, but those critiques need to be accurate. The one good thing you can say about mainstream treatments of this topic is that they usually do touch on the critical challenges that REDD projects face. But then they they almost always ignore the real ways these challenges are being met. Let's take just one: tenure, which is generally phrased as being about who owns the land. This is another pillar of REDD, because if indigenous people don't have rights to their land, they can't reap the benefits of REDD. Lack of clear tenure has hurt many indigenous people when loggers and others come to take their resources. Let's now look at how Chief Almir dealt with it. Before starting his project, he asked Forest Trends (which publishes Ecosystem Marketplace) to see if there was a way to straighten out the tenure issue. Forest Trends commissioned the law firm of Trench, Rossi and Watanabe (an associated firm of Baker & McKenzie) to determine if the Surui actually owned the rights to carbon in the trees on their territory. They found that, yes, indigenous people do own the rights to income generated by carbon sequestration, and Chief Almir then leveraged this opinion into support for his project. It was a deft political maneuver, and now other indigenous groups are building on that, and similar dynamics are playing out across the globe. REDD, in other words, is being used to help indigenous people resolve the tenure issue that loggers and others have worked so hard to obfuscate, which means REDD is helping people make progress on a thorny issue that decades of more traditional "activism" have failed to address, yet the Atlantic ignores this fact - just as it ignores almost anything that's happened in real-world REDD in the last three years. Take, for example, the REDD Offsets Working Group (ROW), a scientific body that just wrapped up years of open consultations among indigenous leaders, environmentalists, and governments. The ROW codified a set of rigorous procedures for making sure REDD works both for the environment and the indigenous people who use it, and it published a detailed backgrounder and policy brief in English, Spanish, and Portuguese that addresses all the issues that the Atlantic implies aren't being dealt with. That's the real REDD: a concrete set of rules and procedures agreed on through an open process among diverse stakeholders and delivering tangible results - yet it's been virtually ignored by the mainstream media. Instead of trying to first understand and the explain and question real-world REDD, mainstream publications have been devoting massive amounts of coverage to swindlers pushing imaginary projects, and then daring to quote people who dismiss real carbon quantification processes as "imaginary" (as The Atlantic did) or unworkable (as Harper's did three years ago in a cover story called "Conning the Climate: Inside the Carbon-Trading Shell Game"). The Harper's piece wasn't as bad as the recent Atlantic piece, but it did commit the sin of sloth. The author brought the reader on a colorful journey into the rainforest, laid out the concepts, and then abruptly concluded that it was all so complicated that it will never work. Ask Chief Almir how "imaginary" or unworkable the process is. 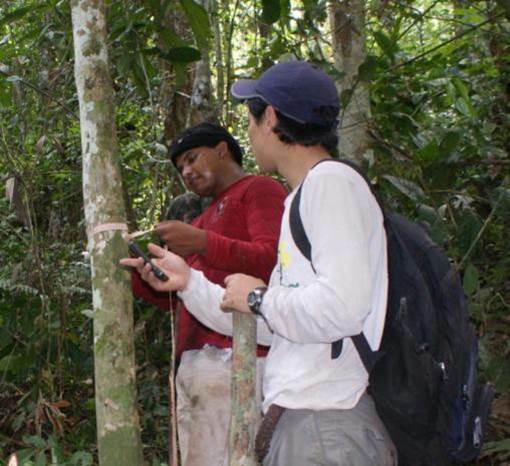 Members of the Paiter-Surui measuring trees to determine their carbon content. In order to earn their carbon offsets, the Surui had to first determine which parts of their forest were in danger, and then they had to prove that only finance from the sale of offsets would enable them to save it. After that, they had to develop a plan for saving it, then get that plan approved by a series of auditors and review panels, then implement a logging moratorium, then enforce that moratorium, and finally prove that they did everything they said they were going to do. As a first step, they brought in economists from a Brazilian organization called IDESAM to analyze logging patterns and the economic needs of indigenous people in the region. The economists looked at patterns of land-use across the region and developed new analytic tools and methodologies using the detailed rules of VCS. Those rules, in turn, follow principles that the Intergovernmental Panel on Climate Change (IPCC) developed by drawing on decades of research by thousands of independent scientists into what causes deforestation, how to measure the amount of carbon captured in trees, how to determine what is and isn't "endangered", and how to credit people for positive interventions. After all this, the economists concluded that, of the 248,147 hectares that comprised the Surui territory, roughly 13,000 hectares would have to be converted to farmland over the next 30 years if the people were to survive. Thus the Surui will only receive carbon offsets for protecting a small proportion of their territory - the portion they would have had to harvest to survive. It's this type of nuance that underscores another of the great misconceptions on REDD: for, while clowns like Nilsson (and reporters who fail to do their homework) assume that REDD is a lucrative endeavor, the fact is that while it can be a money-maker, it's nowhere near as lucrative as logging or farming. As Chief Almir says, "It will always be easier to chop down the forest than to preserve it." And preservation is an active endeavor. Chief Almir and his people spent the long and tedious VCS assessment period patrolling the territory to keep out illegal loggers. He also threatened to prosecute even members of his own people who colluded with loggers, and the loggers responded with a bounty on his head. At least one local tried to earn that bounty, so the federal government assigned members of the elite Força Nacional to give him 24/7 protection. Despite these challenges and the best efforts of opponents to discredit him and the financing mechanism - including many quoted in the Atlantic article - Almir persevered. In August, Brazilian cosmetics giant Natura Cosméticos stepped up to buy the first tranche of Surui Carbon Credits, and now scores of other indigenous people are developing projects of their own. This is all part of a rigorous process that's evolved over decades - the same process that the Atlantic dismisses as "imaginary" and Harper's dismissed as too complicated to work. Well, yes - it is complicated, but it's also working, and it's working incredibly well. What's not working is the media that's charged with informing the public - largely because a contingent of ideologically-driven organizations are hell-bent on making sure that non-traditional conservation finance never gets a fair hearing, and because reporters aren't doing their homework. If they did actually open their books, they'd find plenty of material from organizations like Forest Trends, Conservation International, and others. Mindful of the knowledge gap, WWF recently teamed up with the University of California at San Diego to launch a course in terrestrial carbon accounting. I took the course this summer, and can tell you that baselines are far from "imaginary". They're just not as much fun to write about as characters like Nilsson are. The failure of media to even try to understand these new tools for conservation finance is a truly global tragedy, because we stand at a critical juncture when both forests and the people who depend on their services - that's all of us, by the way - are in a peculiar race for survival. On one hand, trees are mopping up the carbon that we've pumped into the atmosphere, and because there is more carbon to mop up, they're getting fatter at a faster rate than they did before. Trees we save today, in other words, could end up sequestering more carbon than they have in the past, making conservation an even more valuable tool than it's been to date. But the research is mixed on how forests will respond to climate change. Intact forests may continue to thrive - or they may succumb to droughts and pestilence. That's already happening in the Pacific Northwest, where the northern pine beetle is thriving in the longer summers, and trees are dying as a result. REDD in one of many tools that we can use to slow climate change, but it has its limitations, and it needs to be examined critically if it's to deliver meaningful results. That's why we need the media to let us know if REDD is working or if it isn't - but they can't do that if they're so preoccupied with cowboys and cartoons that they neglect their calculus. If they're going to report on REDD, they need to first invest a bit of time into learning what it is. VCS is REDD. ROW is REDD. Nilsson is not REDD. A combination of ideological campaigning and journalistic laziness got us into the climate mess. A similar campaign is conspiring to keep us from exploring very real and scalable solutions to that mess, and journalistic laziness is again enabling that campaign. By swallowing the disinformation fed to them and not learning before they lecture, outlets like the Atlantic could end up doing more damage to forests and forest communities than all the carbon cowboys combined. Ecosystem Marketplace is a news service focused on identifying workable solutions to sticky environmental challenges, and the Skoll Foundation recently invited our parent organization, Forest Trends, to join the Social Entrepreneurs' Challenge. Every $1000 we raise makes it possible to commission a free-lance feature story, while smaller amounts help us cover the cost of breaking stories. Click here to help us to keep the information flowing.